Some people might find cemeteries to be a depressing reminder of our ever-present mortality, and that's totally understandable, but where some only see the inevitable approach of death, others see opportunity. After all, our graves give us the rare opportunity to define one small aspect of how people are going to remember us once we're gone. A gravestone is a place where you can highlight your legacy, offer words of comfort to your loved ones, and maybe even inspire people for anything from years to centuries after you've returned to the dust. Or failing all that jazz, you can just decide to get weird and wacky and funky with it. Plenty of people have done exactly that, including some pretty notable names that you might recognize. From bizarre pyramids to giant heads and all the way to America's most prominent "spite tomb," here are the famous people with very eccentric graves. 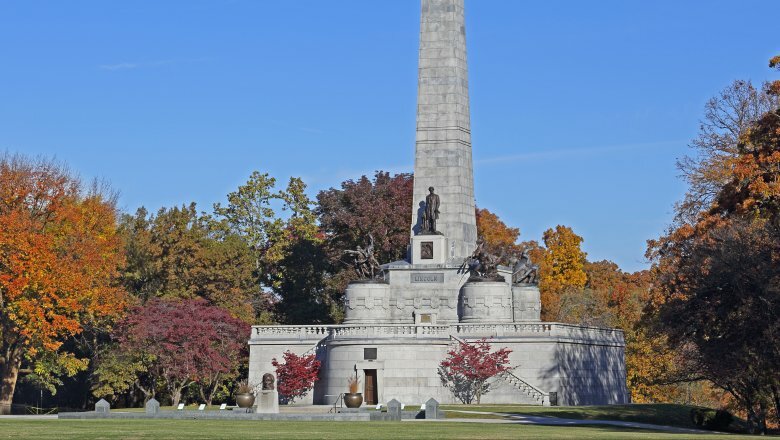 If you're ever in Springfield, Illinois, you'll probably want to go to Oak Ridge Cemetery and see the final resting place of Abraham Lincoln. It's a beautiful marble tribute to the 16th president, capped off with a towering 117-foot obelisk, adorned with statues of the man who held the United States together during its most divided period. Oh, and while you're there, you can also check out the "spite tomb" of Roy Bertelli, also known as "Mr. Accordion." Don't worry about finding it, it's pretty hard to miss. Bertelli, a veteran of World War II and an accomplished accordionist who played with Lawrence Welk, was a Springfield native who had always admired Lincoln's tomb. Needless to say, Oak Ridge is a pretty full cemetery, but when Bertelli inquired about purchasing a plot, he was able to buy a small one that just happened to be located right beside the path to Lincoln's tomb. Unfortunately, Oak Ridge later said they sold it to him by mistake, and threatened to take him to court if he didn't relinquish the piece of land. It turned out that Mr. Accordion was not to be trifled with. After successfully defending his ownership of the plot, Bertelli set about constructing a tomb that was specifically designed to piss off Oak Ridge for trying to keep him out of their graveyard. The result: a full-sized above-ground granite tomb capped off with a carving of an accordion and a description of Bertelli's "lifelong dedication" to the instrument. He didn't stop there, though — before his death in 2003, Bertelli would often go to the cemetery and use the tomb as a stage, serenading visitors with his accordion. When he finally passed away in 2003 — after paying for the perpetual care of the tomb so that it would be there forever — Bertelli apparently decided that Oak Ridge wasn't good enough for him and had himself buried in a veterans' cemetery at Camp Butler. No true fan of American history should miss the surprisingly modest grave of David Rice Atchison, our 11½th (?) president. If you're scratching your head trying to recall his administration, don't bother — like his headstone says, he was only president for one day. Technically. Sort of. Maybe. Here's how it went down. After winning the 1848 election, Zachary Taylor's term as president was meant to start on March 4, 1849. The problem was that March 4 was a Sunday, and Taylor refused to be sworn in on the Sabbath for religious reasons. 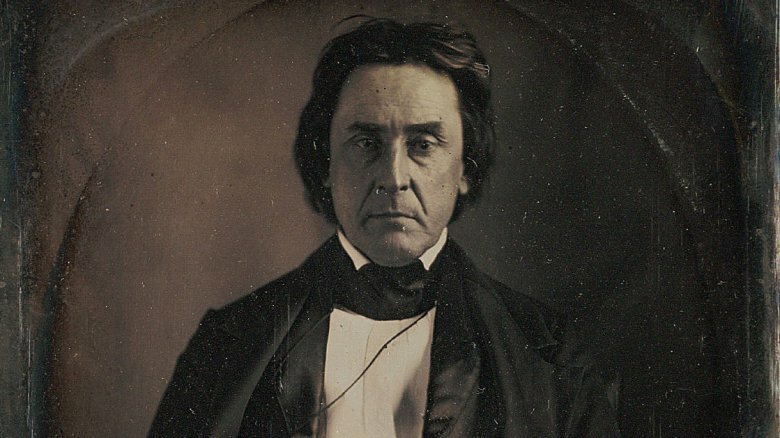 Since James K. Polk and Vice President George Dallas were constitutionally out of office and incoming Vice President Millard Fillmore hadn't been sworn in yet either, the office of president constitutionally fell to the president pro tempore of the Senate: Missouri's own David Rice Atchison, who technically held the office for 24 hours until Taylor was sworn in on March 5. Of course, for every technicality that declares him 11.5, there's another that dismisses it. Like Taylor, Atchison wasn't sworn in as president on March 4, or ever, but he had taken his oath of office as a senator (and his position in the line of succession) two days earlier. He also never performed any of the duties of the president, which would lead him to joke later that he'd had the most honest administration the country had ever seen. Still, Taylor himself only lasted 16 months in the office, and if we're going to count William Henry Harrison, who spent about a third of his 30-day presidential tenure in bed sick, we might as well count Atchison, too. The folks who made his headstone sure did. Bob Kane spent his entire life hogging all the credit for creating Batman, so it makes sense that a little thing like dying wouldn't stop him from keeping it up well into the afterlife. To be fair, though, his astoundingly self-aggrandizing tombstone does finally give credit to someone who helped in the Dark Knight's creation: God Himself, who used Kane as a medium to bring His perfect vision of a vigilante dressed up like Dracula to the comic book page. For those of you not up on your superhero history, Kane (and God, it seems) had another collaborator on Batman: Bill Finger. While Kane came up with the name (and sketched out a character in a red costume with bat-like wings), Finger was responsible for stuff like the darker costume with a cape and cowl, the origin story of the Waynes being murdered, the name "Gotham City," the Batmobile, Robin, the Joker, Catwoman … you get the idea. Unfortunately for Finger, Kane's contract specified that Kane would be credited as the sole creator of Batman forever. Kane would eventually give Finger some credit, but he waited until well after Finger was dead to do so. 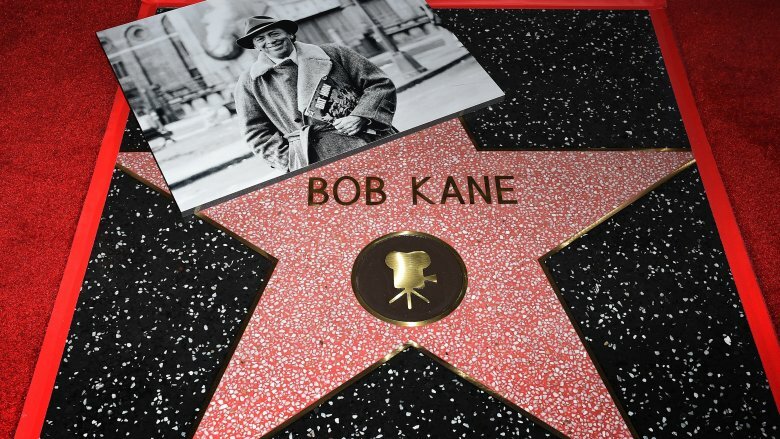 While he was alive, Kane referred to Finger as having "hallucinations of grandeur," and it wasn't until 2016 that "With Bill Finger" as added to the official credit, first appearing in Batman v Superman: Dawn of Justice. Alas, it seems the Almighty will just have to be content with His inclusion on Kane's tombstone. The best part of all this? Claiming divine inspiration is almost enough to distract you from the part where Kane's tombstone says that he himself is Batman. My, what a big head you have! Karl Marx is best known as the philosopher and political theorist who authored The Communist Manifesto, which popularized the economic movements we know today as communism, socialism, and — of course — Marxism. If you'd somehow never heard of him and only encountered him through his tombstone in London's Highgate Cemetery, however, you might just assume that he was famous for having a truly gigantic head. 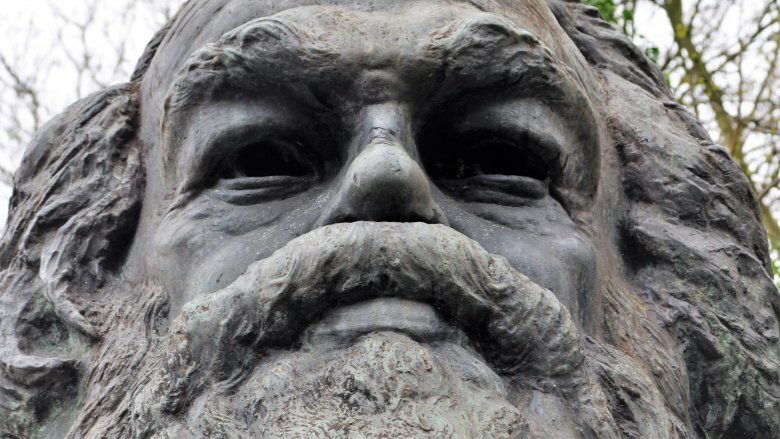 In 1954, 71 years after Marx's death, architect Laurence Bradshaw and the Communist Party of Great Britain decided to immortalize Marx with a tomb that, as Bradshaw put it, would be "not a monument to a man only, but to a great mind and a great philosopher." 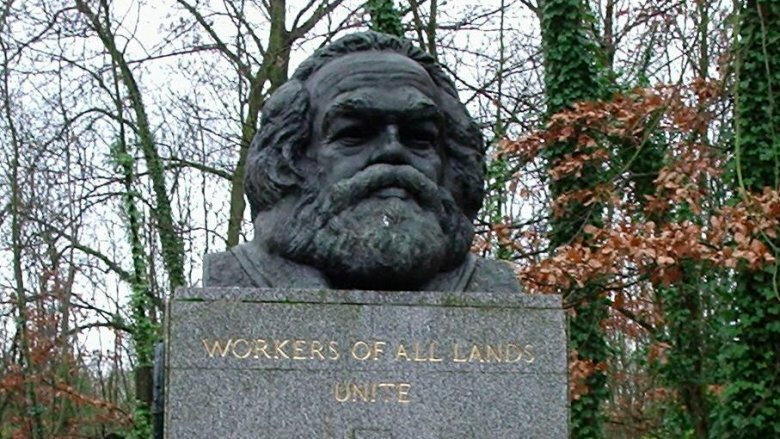 The result: a ten-foot rectangular granite plinth capped off with a statue of Marx's head which is itself almost 3 feet tall. To Bradshaw's credit, it absolutely gets his intent across: With a brain three times the size of a normal man's, how could Marx not have a great mind? Needless to say, the grand tomb has attracted quite a few visitors, both from communist devotees and ardent opponents, which has led to what might be the biggest irony in the history of grave sites. In order to cover the costs of maintenance, the cemetery charges an admission fee of about six bucks for visitors to Marx's tomb. That's right: You have to pay to see the final resting place of the father of communism. Capitalism wins again, baby! Considering that he was the 20th century's most celebrated escape artist and that he promised to find a way to communicate with the living if there was an afterlife, Harry Houdini's death is already pretty interesting even before you get to the lavish tomb in Queens. By the standards of the rest of this list, it's a pretty dignified affair, a white marble monument with a statue of a woman in mourning. What makes the Houdini monument so notable is something that actually wasn't there for about 40 years. 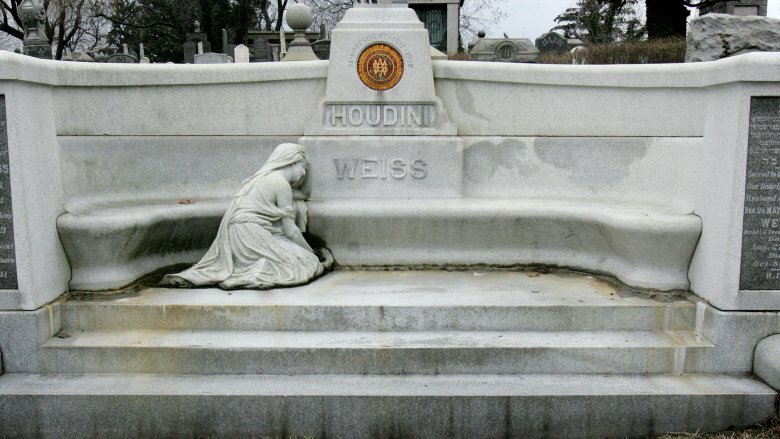 When it was originally built, the monument included a bust of Houdini himself — the only such bust in the cemetery, as Jewish cemeteries do not usually allow graven images — but it was destroyed by vandals in 1975, and attempts at replacing it with temporary busts resulted in Houdini's head being stolen pretty frequently. Finally, in 2011, a group of enthusiasts who called themselves the Houdini Commandos took it upon themselves to reinstall the bust in what is sometimes called a "guerrilla restoration." Without the knowledge or consent of the cemetery, the Commandos created a concrete bust from a mold once owned by Houdini's wife and snuck equipment into the cemetery to mount it atop the monument. Eventually, they were caught by the cemetery watchmen and staff, but it turned out that this weird kind of reverse vandalism was something the cemetery actually approved of. Houdini's head was restored, and the cemetery decided to keep it there by closing for three days every Halloween to keep people out. 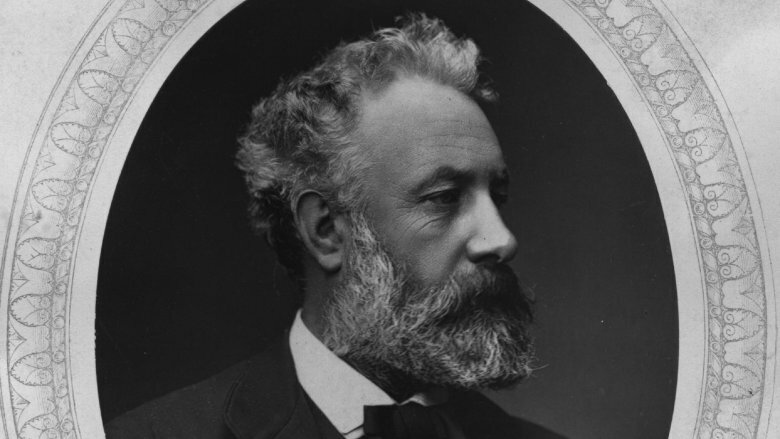 Given his body of work, you might expect Jules Verne's tomb to be modeled after the famous Nautilus submarine from 20,000 Leagues Under the Sea, or maybe just be an exceptionally deep grave in acknowledgement of Journey to the Center of the Earth. In reality, though, Verne's grave in Amiens, France, is marked by a large but fairly standard tombstone. Oh, and also a statue of an extremely ripped, shirtless Verne shattering his own tombstone as he claws his way out of the grave. The statue was added two years after Verne's death and was designed by Albert Roze, who apparently looked at Verne's relatively plain tomb and decided it needed to look more like a Dio album cover. How he knew about Dio in 1907, we'll never know, but the effect is pretty striking, especially since Roze used Verne's death mask to sculpt the face. The result is that 77-year-old Verne has the arms of a weightlifter and is rocketing out of the ground like he was born on the planet Krypton, and honestly? We should all be so lucky to have a grave this rad. Fans never let the grass grow over Hank Williams Sr. Despite dying young at the age of 29, Hank Williams was one of the all-time greats of country music, with an incredible output of hit songs that inspired the likes of the legendary Johnny Cash, the iconic George Jones, and, of course, Hank Williams Jr. As a result, his grave in Montgomery, Alabama, is about what you'd expect, a beautiful plaza with towering, 9-foot white marble headstones for Williams and his wife, Audrey, complete with a sculpture of a cowboy hat resting on Hank's grave. That's not the weird part, though, nor is the giant stone sign with a carving of Williams directing visitors to the Hank Williams Memorial Oakwood Cemetery Annex. No, the weird part is that the graves are surrounded by fake grass. The reason? 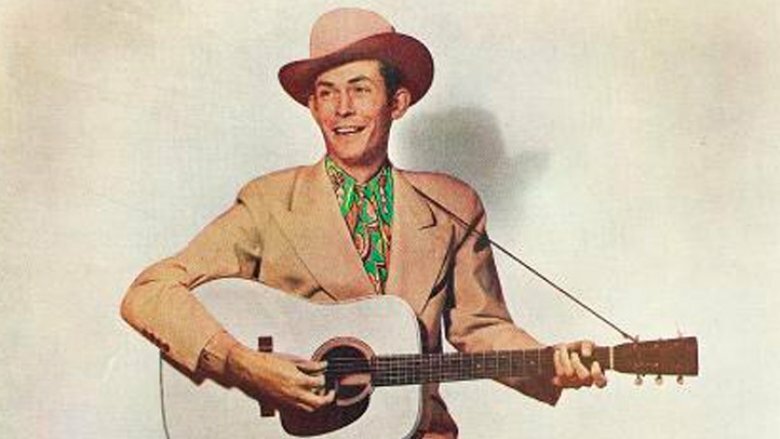 Hank's incredible post-mortem popularity — he racked up five top ten hits after his death, including the classic "Your Cheatin' Heart" — drew so many overzealous fans that the Oakwood Annex didn't have much of a choice in the matter. Apparently, souvenir-seekers would pluck the grass from around Hank's grave, a bizarre act that seems to be entirely confined to Williams, leaving the ground so bare that a bright green square of AstroTurf was preferable. It's still there all these years later, along with a plaque installed by Hank Williams Jr. politely asking fans to not desecrate his father's grave. For true crime fans, there are few names as notorious as Herman Mudgett, also known as Dr. Henry Howard Holmes. 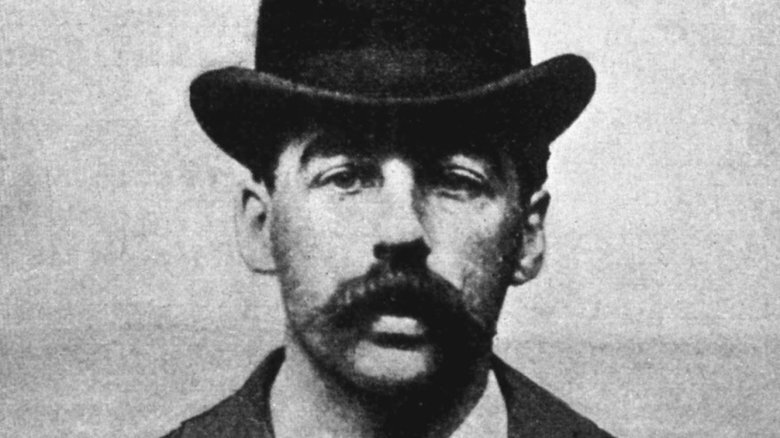 From 1891 to his arrest in 1894, Holmes killed at least 27 people — that's how many he confessed to — in what was later dubbed his "Murder Castle." This 60-room hotel was built by Holmes and riddled with secret passages and traps, including airtight rooms where he'd suffocate victims, rooms with metal walls that he'd heat with blowtorches, vats of acid, chutes for dead bodies, and even more horrifying tools of the serial killer trade. It won't surprise you to learn that Holmes was sentenced to death by hanging, but before the sentence was carried out, he had a request for his burial. Rather than a standard grave, which he feared would be an easy target to grave-robbers looking to dissect him — or, you know, at least 27 justifiably angry families — Holmes requested that he buried ten feet down with his body encased in concrete. As you might expect given his elaborate murders, that strange request gave rise to a theory that maybe Holmes had escaped the hangman's noose after all, and the request was just to make sure that a switch with another unfortunate soul wouldn't be discovered. Just to be sure, the body was disinterred and examined in 2017. Because of the concrete shell, the body was completely decayed, but his clothes, and even his mustache, were preserved. Fortunately for everyone other than the conspiracy theorists, dental records indicated that this was in fact Holmes. 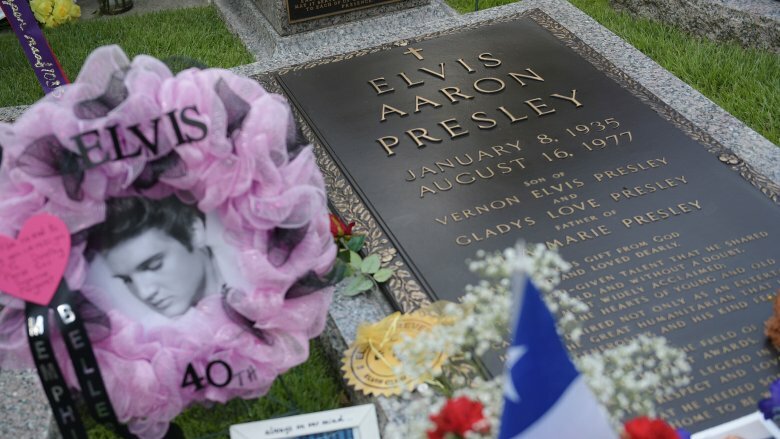 Virtually every fan of Elvis Presley knows the King is buried at his famous Graceland estate in Memphis, Tennessee, alongside several members of the Presley family. It's a huge tourist attraction, to the point where the only house that has more visitors every year is the big white one at 1700 Pennsylvania Avenue in Washington D.C. But what if you're a fan of Elvis and you're a little too far away from Memphis to make the trip? What if you're in, say, Melbourne, Australia, 9,000 miles away from Graceland? Well, don't worry. Elvis has a grave there, too. Okay, so technically, Melbourne's Elvis Presley Memorial Garden isn't a grave — which make sense since there's not a body in there — but it is located in the heart of the Melbourne General Cemetery, complete with a tombstone. The weird part? While he toured pretty extensively, Elvis never went to Melbourne. In fact, he never even went to Australia. That did not stop the Aussie chapter of the Elvis Fan Club from commissioning the memorial back in 1977, and to this day it doesn't stop fans from visiting to pay their respects, either. 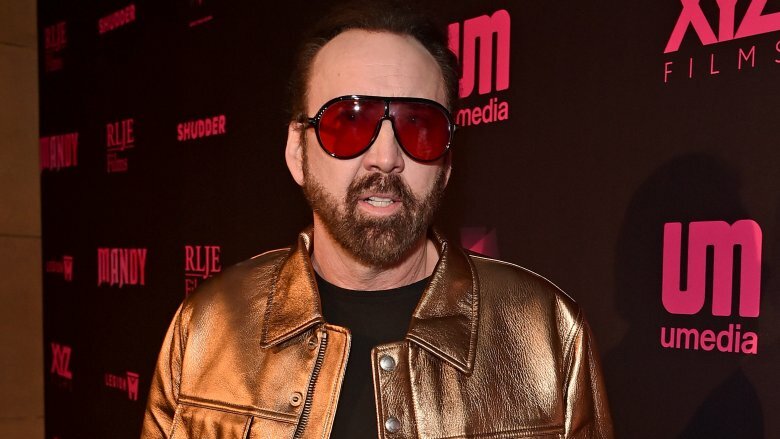 Don't worry, you didn't miss anything — as of this writing, Nicolas Cage is very much alive. He has, however, been planning for the inevitable since 2010, when he purchased a burial plot in New Orleans' oldest cemetery, the historic graveyard known as St. Louis No. 1. He's even built the tomb in which he expects to spend the centuries once his life is over, and folks, it is a doozy. Tucked away amid graves that date back to 1789 — including the legendary Voodoo priestess Marie Laveau, who is believed to be entombed near Cage's plot — is a monument that might just mark Cage's most lasting artistic venture: a 9-foot ultra-modern pyramid emblazoned with the Latin phrase "Omnia Ab Uno," or "Everything From One." But c'mon, is any of that surprising? It's Nicolas Cage! Did you really think he was going to spend eternity being any more chill than he was in life?